Is Wshful a Scam or Legit? Read 11 Reviews! Wshful Exposed — Will You Be Wishful for Winning? What do you think “wshful” would stand for? I’m guessing wishful re thinking about winning a lottery syndicate. Looking at Wshful.com, I think you’re going to have to wishful to actually win anything. This is an online lottery provider that deals only in syndicates and only in two lotteries. Well, theoretically, they add a third one in their referral program but that’s it. More importantly, it all comes down to the numbers and though I’m not a mathematician, these numbers are not adding up for me. 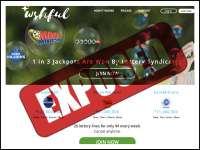 Wshful offers three levels of syndicates for two lotteries – EuroMillions and Mega Millions. Their Basic $5 a week buys players into 5 EuroMillions and 5 Mega Millions tickets a week. Each syndicate/draw has 88 shares. The next level is the Standard for $12 per week for 15 tickets times 2 lotteries twice a week again shared between 88 shares. We’re still looking at 15 tickets by 88 shares for each draw. The top level is Premium with $20 a week for 30 tickets per lottery for 2 weekly draws. We’re still talking only 30 tickets to 88 shares for each draw. There is no information on how they choose the actual ticket numbers. Why Do You Play Syndicates? The whole point of playing in a syndicate is to maximize tickets to shares. The good syndicates definitely have more tickets than shares. This one doesn’t even come close. The minimum buy in here is for 4 weeks. It seems fairly simple to opt out though you can’t officially until you finish that specific 4 week subscription. Players earn 6 wshful points when they first subscribe. Each referral that registers earns players 1 point and each that subscribes earns players 10 points. For each 10 points a player accumulates, this is good for 5 bonus lottery lines for US Powerball for 5 weeks. It looks like that is one ticket per week (even though we know Powerball is played twice a week). Get to 100 points and you get a year’s worth of bonus lottery lines. If a players’ winnings are below £50,000, LotteryTech will collect the winnings and then transfer the money to your account. If the winnings are over £50,000, Cloud Canyon Ltd. collects the prizes and then shares it with all of the syndicate. Wshful.com says there are no administration charges unless the prize is less than £3. You did note the two different companies. Wshful.com is owned by Cloud Canyon Ltd. They purchase the tickets through LotteryTech. Cloud Canyon Ltd. is registered in England and Wales with a snail mail address in London. There is also an email address and phone number. Customer service is available 9:00 am to 17:00 pm GMT Monday to Friday. Wshful.com says allow for 48 hours for any response. Players must be 18 years or older (or the legal age to play where they reside) and can be from anywhere except the United States. One of the hilarious things is that in their terms and conditions, wshful.com says you can particularly play from Australia, Canada, Europe, New Zealand and South Africa. Syndicates are a great way to increase a player’s odds of winning but most good syndicates have more tickets than shares. This one doesn’t come close. Players are going to be wishful thinking about winning. Wshful.com gets a thumb’s down. Shop around for good syndicates and make sure you do your math. It’s a great way to play lotteries when the numbers work! £4 buys a share of 20 lines, so around 10 times the chance of winning. However, 10 times the chance of winning 1/88th of a prize, not 1/10th. Now, I know they have overheads, but come on… that’s ridiculous!! This seems like a great way to play the lottery. Easy to use site that feels like good value for money. Nice and easy site to use. Feels like good value too. Definitely one of the best sites for lotto out there. I love it! As others have said, you get lots of chances for each and every draw for euromillions, powerball and mega millions. I’m on the silver package and it feels like great value, especially when you factor in the nice loyalty offers that you get each week. I’ve not seen any decent rewards from any other lottery sites I’ve used in the past, so going to stick with Wshful for now. Seems good so far. Saw it in the daily mirror with a nice welcome offer. I like the concept and the loyalty bonuses are the best I’ve seen from any lottery site. Just got to see if my syndicate has any luck. Joined for the Euromillions superdraw and pleased with what I’ve seen so far. Good mix of lotteries where you get a lot of lines each draw, and relatively cheap. Am I missing something? For a weekly subscription of £4 I get a huge number of chances to win compared to the £2.50 a single line on the Euro Millions costs. A couple of the reviewers don’t seem to get that it’s a subscription service and a syndicate, not sure why as it’s pretty clear! My share will be low percentage wise but the size of the jackpots more than makes up for that – both Mega Millions and Powerball usually have jackpots over £200 million, so I’d still be a millionaire if I won. I’d take that! What’s the point, if all you get is a penny from your winnings. This Information is not available on their website if I knew I would not have wasted my money. For example in one of the games my winnings was supposed to be £4.40 but I received £0.05, this has been going on for awhile, I sent them an email to ask why my winnings was so small, no response, I decided to call them, I was told my winnings was shared equally with everyone else in the game, so I asked if their winnings will also be shared with me, but the man on the phone avoided the question and told me to visit their website. Just as the name “Wshful”, you can only wish, don’t expect to get any real money even if you win. I’ve cancelked my subscription and will be more careful in the future. I’ve used Wshful for a few months now and love the number of chances I get to win. It’s also very easy, no messing around picking your numbers for each draw, it’s all automated which is great for someone like me. I’ve always enjoyed being part of a syndicate but couldn’t find any trustworthy sites until now. It’s a breath of fresh air to see a company located in the UK rather than some offshore tax haven…..